The Dentalaire DC Dental X-Ray Generator stands out from the competition, thanks to the full-size LCD display, large easy to distinguish buttons and ergonomic modern design. You can select the kV and time settings of your choice or choose from the pre-programmed techniques. The positioning arm is constructed entirely of aluminum using the highest international grade tolerances, frictionless joints and a precision braking system to ensure the tube rests where you place it. The Dentalaire SimpliScale™ Periodontal Therapy Kit features groundbreaking instrument design that provides all the instruments needed for cleaning and treatment of periodontal pockets, using six instruments instead of nine ordinary instruments. These six instruments plus the probe/explorer in the kit are all that is needed to deliver complete periodontal therapy for canine and feline patients. Each universal Gracey instrument replaces two standard Gracey instruments. 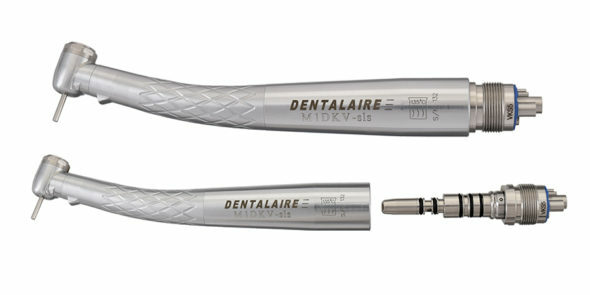 Experience 360° rotation with the new Dentalaire Swivel High Speed Handpiece, in both fiber optic and non fiber optic. 360° rotation reduces wrist fatigue resulting in much more control.